DUE to its small depth, PMA’s new four-channel temperature controller, available from ECEFast , can be mounted directly in cover panels and control cabinets. 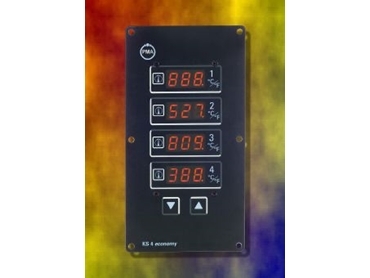 All four two-point controllers have thermocouple inputs (0-900°C or 1350°C; Types L, J, K), complete with input circuit monitoring and a logic output for the actuator. Two freely adjustable limit signals per zone are connected to two common alarm outputs. An optocoupler input is provided for an external signal for set-point lowering (standby temperature as a common second set-point). The controllers can be configured individually as signaller for limit monitoring, as positioner for any duty cycle, or as two-point controllers with DPID behaviour. The automatic self-tuning function can be started either for all controllers together or individually, and ensures optimum control parameters, also with thermally coupled control zones. The KS 4 features four control loops, is extremely easy to operate, and particularly attractive for machine and plant builders. Custom front face panels are available for OEM requirements.